San Diego Comic-Con has come and gone, and we got the Walking Dead panels we were waiting for: two of them, as promised, one for the spinoff which we’ll discuss in the next post. For now, we focus on the panel most related to the subject this entire site is (sometimes) built around. There are a lot of panels where shipping questions are ignored, but to their credit, the staff addressed the growing demand for a Rick/Michonne pairing. They suggested they would only take things in that direction if it felt natural, and while it’s not out of the question for the future, currently they don’t feel that kind of chemistry exists between them. The panel promised that when the show comes back on October 11, the first episode will be a full 90 minutes in length. The Walking Dead is no stranger to the extended format, having premiered its very first episode this way and subsequent season premieres thereafter. 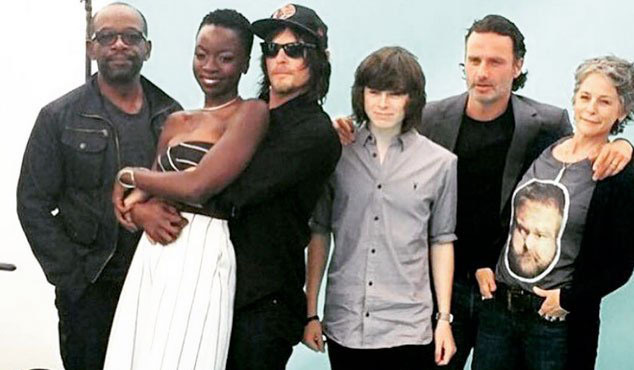 The panel also promised that this season premiere would pack more Walkers per minute than any other, which is saying something given how mobbed our cast of survivors has been in the past. We’ve seen entire fields and cities filled with them; going bigger doesn’t feel possible. Are we looking at something like Zombie Woodstock? The panel contained all the significant cast members and executive producers, with the notable exception of graphic novelist and creator of everything Robert Kirkman. He was sick, so in his place a cutout of his face was held aloft on a stick by other panelists. Unfortunately we must report that no one tried to cartoonishly mimic his voice.